Update: Zachary’s 1:54.14 timing is a new youth boys record pending ratification, and not the under-17 Boys record. 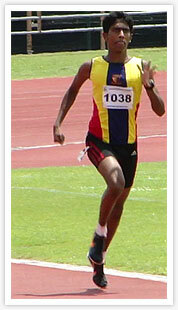 S.Pandian still holds the Under-17 boys 800m record. We apologise for the mixup. At the last edition of the SAA Track and Field Series 3, 16-year-old Zachary Ryan Devaraj lowered the long standing 800 meters Under-17 Boys record. The ACS (Independent) student erased the 28-year-old mark held by S.Pandian from 1:54.3 to 1:54.14, pending ratification from SAA. His feat places him sixth on the fastest 800m all-time list ran by a Singaporean. Not only Zachary is an established 800m runner, he’s also quite accomplished in the distance events. The Youth Olympic Game athlete was last year ‘B’ Division National Inter-School Cross-Country Championship champion. His talent is not only restricted to middle distance events, this up-and-coming athlete who was previously singled out by Wilson Kipketer as a potential champion, Zachary showed much promise in the quarter-miler event too. He was part of the ASEAN School 4x400m relay team that won bronze last year. The 3:20 minute timing set by these schoolboys was the fastest time set by a Singapore team last season. Below is a profile of Zachary’s expected pursuit of success. Q) Did your training & trial-runs gives any indication that you might be running such a fast time? Zachary: Yes, I was training to go below 1:56. However I did not have any time trials but I was very focused in my target to go below 1:56. Q) After the run, did you realise you just ran an excellent 800m race, that you’ve just set a new u-17 record? Zachary: As I approached the finishing line I realised that it was a very good timing. I had to wait for the official time to know I had set the U-17 record. I knew this as I kept track of the records for the 800m event. My coach gave me list of all the records last year as a motivation, and wants me to train hard to break them. I am just happy and relieved to go below 1:56. Watch Zachary Ryan Devaraj ran a lifetime best in the 800m at last weekend SAA T&F Series 3. His 1:54.14 timing was enough to erase the under-17 800m Boys record and marks his the fastest Singaporean this season over the distance. Q) What was your pre-race running tactics going into your record breaking run? Did you managed to stick to it, or did you deviate? Zachary: I must thank my training partner, Md. Feroz Shah for setting me up for the first lap. He set the pace for 56 seconds for lap one. My job was just to draft him closely behind for the first 400m. At about 450m, Feroz moved aside for me to keep the pace going until the very end. I sticked to my race plan throughout. I didn’t deviate. Although the last 50m was a struggle, I was very focused to keep going. I must share this victory with Feroz. Q) What did your coach feedback to you after your race? Zachary: Mr Elangovan said it was a good run. He was very happy with my first lap time as I managed a 56 seconds, for which I usually am not confident to do in races. Q) What are your plans and goals for the future? Zachary: Short-term, I am looking forward to my dream to race with the best at World Youth 2011 in July in France. I HOPE to qualify for the semi-final there. That’s my biggest target this year. Long-term wise for the future, perhaps in six years time I wish to win a medal at the SEA Games. Q) What are your thoughts and expectation for your upcoming National Schools Championship? Zachary: My goal for Nationals is to win the 800m and 1500m. I am not really looking for a good time but the main aim is to be the first. It will not be easy as all the athletes would be very well prepared for this. Anyone can spring a surprise and record a better time too. But I will prepare myself for such an uphill challenge. It will not be for individual glory but to bring glory for my school. 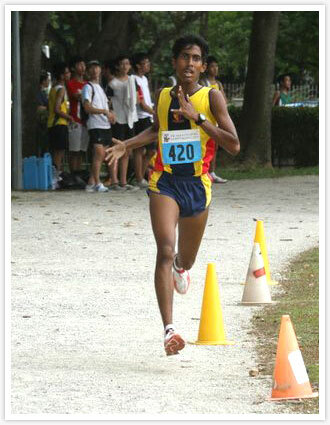 Zachary Ryan Devaraj at the recent SAA Cross Country 2011. He finished second in his age category. Q) Ever thought of ever becoming a quarter-miler? Zachary: Actually I started with the 400m event when I was in Primary 4 but the 800m has become my pet event now. I do not train especially for the 400m events. Its a good question. Why not, who knows perhaps maybe in the future I could give 400m a shot. I do also enjoy running in the 4x400m relay as its a wonderful feeling to run as a team. We had a great time in the Asean Schools 2010 achieving the 4x400m boys bronze. Q) How supportive has your family has been in supporting your athletics endeavors. Zachary: I was introduced to running by my family. Sometimes as a family we run, that’s how close we are. The five of us in the family ran in Standard Chartered Marathon last year. I’m blessed with all the support from my family, ACS (Independent), SAA, my coach, friends and running buddies. My parents shows their support by fetching me to all training sessions, attending my races, prepare my meals, etc. I truly believe I will not be where I am today without the support of so many behind me. Q) Any advise to student athletes out there. Zachary: Most of the time I train six times a week. Sometimes I am delayed in training or have to miss a training session as I was dismissed late from school. Of course its a struggle to balance studies and workout sessions, and with that I have to make many sacrifices. Since I am in Year 5 this year, studies now come first for me. Since I have less time to train I make every session a quality one and give my best always.